Ever wanted to meet the stars of Hee Haw? Roy, Buck, Grandpa and Minnie sure brought us smiles but the Hee Haw Honies were most likely the biggest stars of the show! 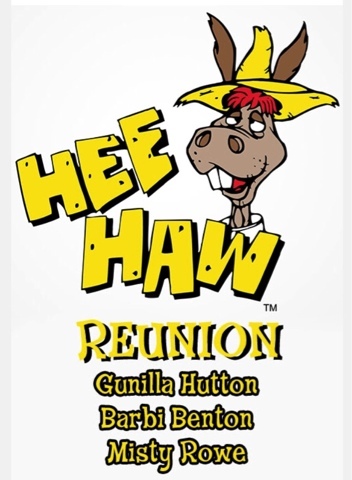 Now you can meet three of the most iconic of the Hee Haw Honies for a special reunion at The Hollywood Collector's Show; Barbi Benton, Misty Rowe and Gunilla Hutton! Now the only thing missing is the beautiful Linda Thompson who lives in Los Angeles. If you can't make the show you can still order autographs from the celebrities in attendance with the personalized messages you'd like. If you do attend you can meet and get autographs. There is an admission fee to attend the convention. Many artists have products for sale, all celebrities charge a nominal fee. You may also get a professional photographer take shots of yourself with any of the celebrities. You may have that professional photo signed later also. Started in 1979“The Hollywood Show is the best known autograph and movie memorabilia show on the west coast. It is held four times a year at The Westin Los Angeles Airport Hotel with actors, writers, performers, collectors and celebrities coming together to meet fans and autograph pictures and merchandise. While visiting with your favorite celebrities, you can explore the vintage movie memorabilia that dealers from across the country have available. You’ll find everything from movie posters & lobby cards to photos, props, costumes and more, so along with some great memories, you can take home your own piece of Hollywood history!”The Hollywood Show has earned the reputation of being "THE PLACE" for celebrities to appear, and known worldwide as the perfect place for fans to get "up close and personal" with their favorite stars! In addition to the fabulous line-up of celebrities offered at each event, The Hollywood Show has teamed up with hundreds of vendors to offer fans the ultimate selection in show related memorabilia and much, much more. The staff of The Hollywood Show works around the clock to bring entertainers and fans together for each of our events. We have a large network of contacts and celebrity relationships that always prove helpful when inviting guests to appear. David Elkouby is also the owner of Star World on Hollywood Boulevard in Los Angeles. Star World is Hollywood's premier destination for movie memorabilia, posters, photos, autographs, toys, action figures,concert videos, scripts, and magazines featuring all of your favorite stars: Marilyn Monroe, Madonna, Beatles, Paris, Britney, Michael Jackson, and thousands more. *All celebrities in attendance will be at the show all day unless otherwise noted.